I received an email this morning from one of our supporters at Hollister who asked if I knew any musicians who suffer from ALS (Lou Gehrig's disease). One of their executives, an avid amateur musician, suffers from this disease and has created a website Does the Music Have to Stop? You never know what's around the corner, and in life's downturns, it affirms that music brings so much peace and beauty throughout all phases of life. Please check out Jim's website to hear and see his story and how much music means to him. It's really beautiful! If you know of musicians who suffer from ALS, please forward the website link to them. He is creating an album of music with submissions from ALS patients who have music to share. I've copied the article I received in the email this morning below. Reading something like this makes you stop and put life's priorities in perspective. 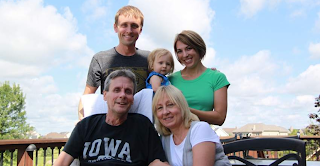 After Hawthorn Woods 55-year-old Jim Stupar was diagnosed with Amyotrophic Lateral Sclerosis earlier this year, the accomplished musician and his family had a lot of questions. Amyotrophic Lateral Sclerosis is a progressive neurodegenerative disease that leads to the gradual loss of voluntary movement, like walking, speaking, swallowing and eventually breathing. Though Jim has since lost the ability to move his arms and can no longer play the piano — his lifelong passion — he and his family are working to build a community of past and present musicians living with Lou Gehrig’s Disease through the ALS Musicians Collaborative. The effort encourages other musicians struggling with the disease to share their music for a digital compilation album that will be released on iTunes on Aug. 30. Through his website, Jim Stupar aims to raise awareness about and money for ALS. He also shares his story and music, while allowing others to do the same. Q: How did your site come about? A: Music has been an important part of my life — writing music — and it was actually one of my goals after retirement to continue to compose music; but one of the unfortunate things that’s happened as a result of ALS is that it’s been impossible for me to play. After I was diagnosed, I received a call from my cousin, Bryan Harris, who is a skilled marketer that uses all different kinds of media. He has worked on the King Tut and Titanic exhibits, and he asked me if I wanted to do something about my condition... tell my story. The site itself is really something he created with my help. He talked to the ALS Foundation and told them about our two goals for the site: To raise money for research and glorify God. So, what we wanted to communicate in the website name was that there is hope, not only for me, but for others that come after me, by enhancing and accelerating the research in this area. So that’s the story of the music. Q: What else do you hope people take away from your site? A: That life is precious — you never know what’s around the corner — and to get the most out of every day, because every day is a gift. Q: Is there a deadline for people to submit their music and personal stories? A: We don’t have a strict format here. I’m not sure how many people are out there that fit into this category — musicians living with ALS — but the sooner the better, of course. Q: Who are some of your favorite musicians? Who inspires you musically? A: I was classically trained in piano for a number of years, until my teachers decided I played well by ear. Then, I played Elton John, the Eagles... they were early influences for me, along with the classical training. I was also writing quite a bit. I’ve been involved in the church throughout my life. I wrote and played songs for my nieces, nephews and my granddaughter’s baptisms. Q: Who inspires you, in general? A: First of all my parents who have taught me fundamental life lessons that have served me well. Second, many of my business colleagues throughout my career. I also like to read fictional history and business books, not because any one person inspires me, but because I like to learn about what people did that worked and what people did that did not work. You pick and choose the bits and pieces and develop your own way of thinking. Q: Does one book, in particular, come to mind? A: My wife and I went to Rome to see the Sistine Chapel and Cathedral, and when I came home, I had to read more about Michelangelo. It’s just incredible, all the things he did in his life... an incredible story about a human being that was so gifted. Q: How has ALS changed the way you look at life? A: I just finished reading Tuesdays with Morrie and there is lot in there that’s true — spend time with the people you love, do things you like to do and prioritize those things because you never know. Right now, I’m still working from home because technology allows me to communicate with the outside world, but I’m also spending a lot more time with my wife, friends and family. We have had a lot of people come for an evening, sit and talk. It’s been a nice reflective time from that perspective, despite living with this horrible disease. You have to take the good with the bad, though. I can get mad and upset, wonder “why me?” and “what am I going to do?” but you have to get on with living and do the best you can with the hand you have been dealt. The key is to make the most of it.